Decorate your home and garden with these adorable 2.5 inch mini terra cota pots! You can fill them with your favorite cacti/ succulent cuttings or even start your own indoor herb garden to keep your fresh herbs and spices at hand in the kitchen. These mini clay pots are so versatile, the possibilities are endless! From easy DIY craft projects to beautiful handmade wedding/party favors, they are enjoyed by all age groups! You can also hang these in one of your favorite macrame planters to brighten up even the smallest of spaces. Terra-cotta pots are made from baked clay. The porous nature of this earth-based medium allows air and water to pass through the walls of the pot; this promotes healthy plants by staving off root rot and disease caused by overwatering. However, this can also cause the soil to dry out quickly, which means more watering. If you have not used these pots before, you might find them smaller than they appear in the photos. These pots are delicate and so need gentle handling. 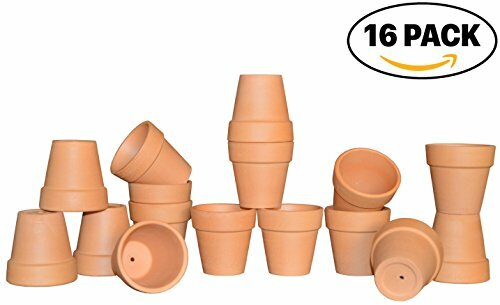 Make sure to check out our other products that go hand in hand with these cute little terra cotta clay pots! Drainage Hole in Pots - Succulents and Cacti Thrive in Well Draining Terracota Pots; Add Porous Soil for Ultimate Plant Comfort and Growth! Perfect for Propagating Succulents/ Mini Cacti & Succulent Cuttings, Indoor Herb Garden, Wedding or Party Favors, Crafts and More!